Photo compliments of Texas Military Forces Public Affairs Office. The Texas Military Forces Hall of Honor program was established in 1980 to provide a means of recognizing outstanding military service and leadership of individuals while serving as a member of the State Military Forces, e.g. Army National Guard, Air National Guard, or State Guard. (a) Any current or former member of the State Military Forces of Texas, living or deceased. (b) The service(s) or deed(s) of the nominated individual must have been of such magnitude to reflect great credit upon the State Military Forces of Texas. The call for nominees usually is disseminated in January of each year. The selection board meets and chooses no more than three inductees. 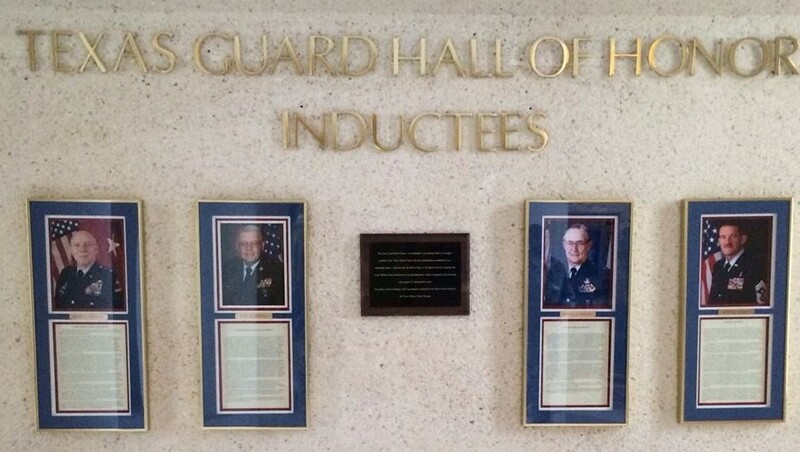 Hall of Honor induction ceremonies are held in conjunction with the annual Muster Day festivities at Camp Mabry. Since the program was started in 1980 more than 95 members of the State Military Forces of Texas have been inducted. Their pictures along with the narrative explaining their services and deeds hang proudly in the Conference Room of the Brigadier General John C. L. Scribner Texas Military Forces Museum at Camp Mabry in Austin.